Pick a headline. Any headline. 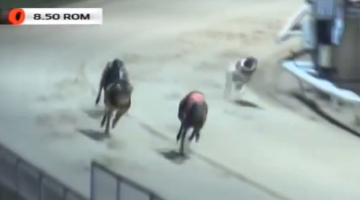 Stunning run from Affane Party – Night to forget for Angela Harrison – This is the reason the bookies sponsor open race competitions. All three would be equally valid on a night of shocks from the William All England Cup first round at Newcastle. Heat 1 – The first of the night’s five beaten favourites appeared in the opening heat with Jaguar Jack expected to repeat his August win over Falcon Bay. But Willie Thomson’s runner, who had a 28.51 win over course and distance was never troubled in a virtual solo performance. Turnhouse Jet was disqualified for deliberate interference, though it did look to be a case of retaliation after he was badly hampered at the first turn by Droopys Policy. Heat 2 – was billed as the big one with one-time English and Irish Derby favourite Droopys Verve taking on the sprint champion turned four-bend star Affane Party. The locals had no doubt that Verve would put the ‘canny sprinter’ in his place, though it didn’t quite work out that way. . .
Punters were desperate for respite and Greenwell Jet duly obliged, though once again, there was a dramatic twist with the disqualification of Glengiblin Steve on the run-in. Heat 4 – and another shock. Who would prevail, the defending All England Champion Droopys Expert or the dog who came so close to breaking the Sheffield 500m track record Nadurra Ross. The answer was neither as the pair put each other out of the competition following some tardy trapping and first bend trouble. Bramble Milburn, the only dog to beat Droopys Verve last year, never put a paw wrong. Ht 5 – and beaten Puppy Derby favourite Droopys Trapper offered some chance of redemption for the bruised and battered Anderson Kennel. But disappointing turned to disastrous following another slow break. The contest went to the 2016 Irish Laurels winner Skywalker Manner following a faultless front running performance. Heat 6 – so onto the final heat and a last chance for punters to stem the haemorrhage. It wasn’t to be as Honour Turbo failed to make it seven wins from his last eight races, as he exited the event. Instead, the front running Bramble Reggie landed his maiden open and in so doing gave Steve Anderson a 35-1 All England double. Director of racing Stephen Gray said: “Although some of the runners may want to review their seedings for future competitions, most of the shocks on the night were down to dogs not breaking to the best of their abilities. We are dealing with very fine margins.